Ecuador’s award-winning ecotourism company, Tropic Journeys in Nature, that since 1994 has led tours through the country’s most engaging landscapes, suggests shopping for locally produced items that underscore sustainable tourism while visiting this Andean country. ”As with most Latin American countries, Ecuador has traditional wares and handmade crafts that are unique to our country and that will cost much less than if purchased at home. Some make really unique souvenirs,” notes Jascivan Carvalho, founder/owner of Tropic Journeys in Nature (http://www.destinationecuador.com/). His company represents two lodging accommodations, one on mainland Ecuador in the Amazon rain forest, and the other on a sparsely populated island in the Galapagos. Both accommodations support local communities and operate sustainably. The company also conducts guided tours of the country’s cultural and historical centers and its highly protected national parks and reserves. “We came up with this preferred shopping list to support Tropic’s goals of creating sustainable, meaningful work that also enhances local communities and the environment,” noted Carvalho. The list includes; Panama hats, leather goods, socks and the Ecuadorian Alpaca hoodie, both made of Alpaca wool; chocolate and coffee; and Dragon’s Blood (Sangre de Drago) that the locals use as a natural medicine for general health and to heal cuts. However, there’s also a please–do-not-buy list, he adds, that includes any souvenir made with animal parts. “This is especially the case for crafts that use bird feathers because it is very likely that birds were killed to get them,” he notes. Carvalho suggests heading to the indigenous market at Otavalo to purchase the Alpaca garments. Both the soft, warm and comfortable socks that come in a variety of colors and the hoodie are traditionally woven with 100 percent Alpaca wool. The hoodie, featuring any number of Andean designs, keeps visitors warm while exploring the high elevations of Cotopaxi and Las Cajas National Parks as well as back at home during the northern winter. Ecuador also boasts a long artisan tradition in leather goods. One way to take advantage of this tradition is to take a factory tour at La Mundial Custom Boots, a partner of Tropic. La Mundial was founded in the Centro Historico of Quito in 1906, and today the company continues to make boots using techniques passed down through three generations of the Rivas Family, while also integrating modern technology into their designs. Tours include a look at the bootmaking process, as well as the benefit of purchasing fully-custom boots at local prices. Pharmacies are a good place to source Dragon’s Blood, a red liquid that is the sap of Croton lechleri, a small tree native to northeastern Amazonia. In addition to having natural healing properties, forming a natural bandage over cuts and possessing anti-bacterial and anti-viral properties, studies have also shown that Dragon’s Blood is an anti-oxidant. 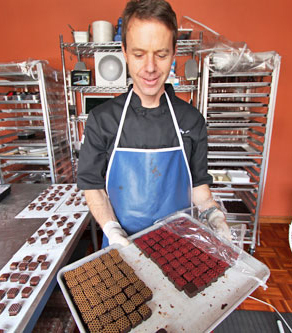 A variety of home-grown, organic chocolates are available at specialty and souvenir stores in places like Mindo, Guayaquil, Quito and most Ecuadorian cities. The Cacao plant is native to tropical forests in the Americas, and farms in Ecuador produce some of the highest-quality chocolate in the world. The country’s mountains and volcanic soils offer perfect conditions for growing coffee. Since the country hasn’t yet made a name for itself as a place that produces fine coffee, there are great deals to be found, even in high quality organic coffee. Bags of quality Ecuadorian coffee can be found in stores in much of the country, with more variety and better deals on Arabica coffee around Loja and towns in Manabi and Guayaquil. For Robusto, check the stores in western Pichincha (Mindo) and the eastern slope of the Andes. The Panama hat is actually of Ecuadorian origin. A good one is both stylish and can ward off the sun. They can be found in classic varieties, from budget-friendly prices to top-end luxury in Cuenca and Monteristo whose artisans make more of them than anywhere else in the world. Carvalho launched Tropic Journeys in Nature to demonstrate that environmentally sustainable and culturally sensitive tourism can be a viable business model. Tropic pioneered indigenous community tourism in the Amazon region with the Huaorani people and over many years has been a consistent supporter, partner and promoter of indigenous tourism initiatives with several indigenous communities and organizations including the Siecoya, Cofan, Siona, Achuar and Quichua. The company also integrates tourism with ecological, economic, socio-cultural and political concerns with local community tourism initiatives in the Galapagos Islands, the Andean region and the Pacific coast region of Ecuador. The communities Tropic works with receive proper economic benefit from all tourism operations. For information and reservations contact: Tropic Ecological Adventures LLC. / Phone: +593-02-2234-594 / 202. 657.5072 (US) / 593. 2. 222. 5907 (EC) / 1.888.207.8615 Website: http://www.destinationecuador.com/.